Let’s fire the question right away. 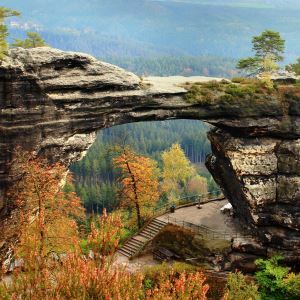 Is autumn in Bohemian Switzerland any different than the other seasons? Yes, it is. The atmosphere is very specific. The fresh chilly air from the river down in the valley rises up to the sun-dried plateaus and mixes with the heartwarming smell of the pine trees. The sensation is guaranteed to stick with your memories of Bohemian Switzerland. And let’s not forget the fog. 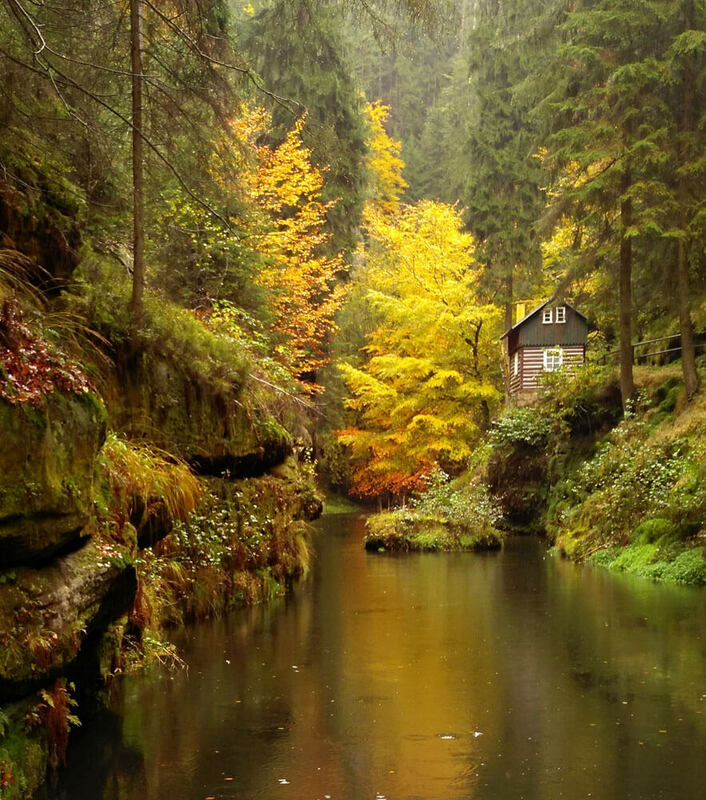 Your morning and evening pictures of autumn in Bohemian Switzerland? Variations of the milky white fog, streaming through the biggest sandstone canyon in Europe. Just awesome. You can go rafting on the Elbe river and spend a great day of water adventures. The next day you can find yourself waving to the other rafters on the river from way up above while climbing one of the sandstone cliffs of Belveder or any other of the many climbable rock walls in the Elbe canyon. “Fun fact” for you – the amount of sandstone formations here is comparable to that in the Arizona or Utah national parks. Not a climber? Go visit Chribska. Get a room at the Na stodolci guest house and rent a horse for the day. You will feel like a cowboy/cowgirl, riding on horseback through the autumn countryside. Just make sure to be back “home” for the sauna (which you have to book in advance) and the dinner at the restaurant of the guest house. We recommend the local beer Lisak (which means “fox” in Czech). And to eat? Definitely, something with mushrooms as the autumn is the right season, so you will get to taste them fresh. 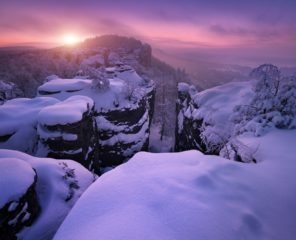 You can hike the plateau of the Elbe canyon in the morning, your feet relishing the cool white sand of the narrow paths among the sand-rocks. Pick the leftovers of wild cranberries and blackberries, enjoy the many viewpoints of the diverse landscape and take incredible photos on a high cliff above the deep forest sea. Then, in the afternoon, you can plan to change the setting completely and explore the canyon from down below. 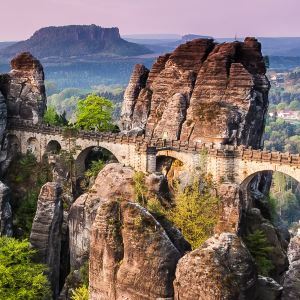 You dive into the dark green valleys, smell the ozone-like freshness of the wet, moss-covered sandstone walls rising from the mystic gorges of Kamenice or simply follow one the many creeks, leading eventually to the Elbe giant. Once you get tired of taking selfies and double selfies with your partner at the viewpoints, it is time to take your loved one to the other parts of the park. 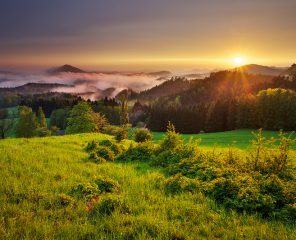 Try the region around Krasna Lipa where the landscape is more open and the rocks and forests give way to wild meadows and gradual hills. There are more leaf trees around here, so get your camera ready for the autumn colors. The crispy autumn air will surely make you hungry. Our advice: do not to lose your precious vacation time testing the local restaurants on your own. Just choose the Falkenstejn brewery in Krasna Lipa, right at the main square. They have proven international cuisine so you won’t risk ruining your trip with something as trivial as dinner. They brew their own, seasonal beers, and we are guessing you will find their autumn special on tap really tasty after the day of hiking. Want a secret tip? Try calling in advance and book a private room right above the brewery. Like that you can just roll upstairs after the good dinner and a few beers. Plan your trip so that it is easy and amusing for the kids as well as you and your partner. How about the Tisa region? You can drive to the spot, leave your car in the parking lot near the Church and take the short path up to the sand-rock town. Your kids will be excited once you tell them that this is the place where the Chronicles of Narnia were filmed. If you do some research in advance, you might even be able to show them the exact scenes from the movie in the very same spot where they were shot. 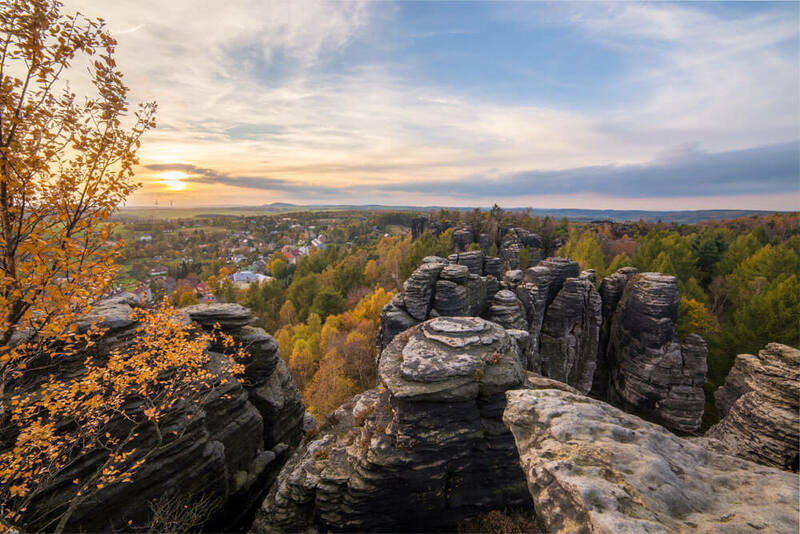 The grown-ups will enjoy the peace and calm under the high-towering walls of the sandstone formations and the views of the autumn-colored rural countryside from their top. At the end of the round tour, pay a visit to Refugio (near the parking lot) where you and your kids can rest during a delicious meal. 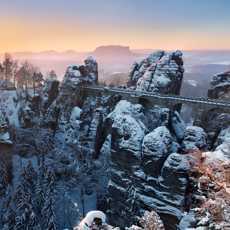 #bohemianswitzerland: Rocky viewpoints, sandstone formations, the big Pravcicka sandstone arch, the Edmund or the Kamenice gorges… Done all those already? Try something else. Something the locals like to do. Make a tour of the lookout towers. It is a real Instagram challenge. To try and capture the specific atmosphere of the 360° lookout tower view, autumn is the best time. The colors will be intense and when you catch the morning or the evening fog crawling lazily through the valleys… wow, those pictures might open an entirely new hashtag chapter. 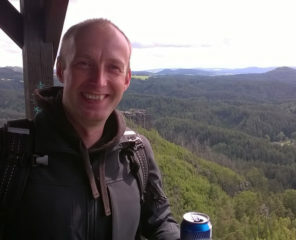 Want a few tips for the most beautiful lookout towers in Bohemian Switzerland? Here is a short list. You just have to check the opening hours before you set out. Some of them are operated by sweet pensioners who like to close earlier in the winter. You can also check out our one day tours from Prague, if you want locals to take you to all the places we mentioned above.